Children with ADHD can be forgetful, impulsive and prone to distractions. Some seem dreamy and lost, while others are impatient, chatty and squirmy. Whatever the degree of severity or the subtype of ADHD your child has, one challenge the majority of ADHD sufferers face is poor task adherence, or the ability to see a responsibility through to completion. This is one of the ADHD impairments that effective prompting can help to alleviate. If your child has trouble staying on task, there are prompting strategies you can try. A timer is both a visual and audible prompt that creates a sense of urgency to help your child focus. Estimate the amount of time required to complete a task, set the timer and place it within view of your child. Try an electronic app that can ring or buzz at specified time intervals to prompt your child to get back on task. Remember to schedule breaks if your ADHD child needs them. Use a timer to signal the end of each break and to prompt his return to work. Try a visual prompt to help your child stick to his task. Visual prompts have the advantage of remaining in place, unlike a verbal reminder, which is gone once you’ve finished speaking. Use notes with color and imagery. Locate these signs in view of your working child and also in key areas of the house. For example, post “Have you finished your homework?” on the bathroom mirror or on the fridge, and take it down once homework is complete. A prominently displayed reward chart or checklist serves as a useful visual prompt. Each task, such as “Put away your clean laundry,” can be checked once it’s complete. The sight of the chart will redirect your child back to the task, especially if there is a reward associated with its completion. 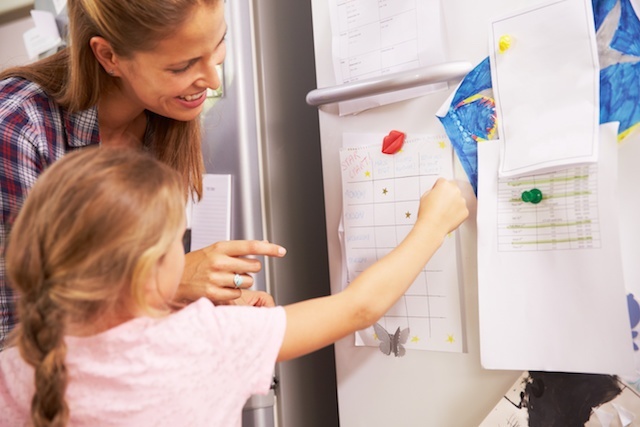 Teach your child to self-prompt with a whiteboard on which he can write his own checklist. At the end of each day, review the list together to celebrate successes and brainstorm future solutions. Prompts not only help to direct behavior, they can also build new habits through repetition. Every time your child is successfully redirected back to a task until it’s done, he develops better completion stamina and may even outgrow his need for prompts.